This Part 2 post on you Kitchen Wish List for Santa focuses on smaller sized stocking-friendly or priced options for under the tree. Both will up your kitchen productivity and make cooking more enjoyable. After reading this, if you didn’t catch Part 1, there’s a link at the end of this post because the principles connect the two parts together and help you build your best kitchen system. Here, and when ever I discuss kitchen tools, I’m urging quality over quantity! But if you can’t splurge across the board, invest in the items you’ll use most. And once you’ve got the new tools below, donate your old ones because you just don’t need lots of tools to be a high functioning cook. I’m going to say that again just so you really take it in, you do not need lots of kitchen tools to be an efficient cook! Speaking of efficiency and productivity, I’m not advocating that you go out and buy every single item listed. Only get things you will use often because there are simple work-around techniques—they just take a bit more time and effort. For instance, if you buy all your cakes, don’t make scones or pizza dough, you probably can skip the scraper/chopping tool I highlight. And if you don’t use lemon or lime juice often, just cut them in wedges and squeeze the old-fashioned way—or buy organic bottled juice. Wooden spoons. These always crack and get stained so I’m guessing yours could use some purging. Olive wood is the prettiest and you can buy them individually or in a gorgeous set. High quality rubber spatulas. Ditto above on cracking and staining; choose a fun color like the featured link or classic white. THIS and only this digital meat thermometer! I’ve tried a zillion of them and others are hard to read or they break but not this Taylor digital – it’s perfect and comes in black or fun yellow. It’ll help you perfect your turkey or roast! A great stainless steel spatula. Probably my most used utensil; my favorite is this pro one and my 2nd fav is a basic or this great rated non-slotted $5.47 bargain or $4 slotted style which are perfect stocking price point. Keep one plastic spatula for use with non-stick pans or opt for wooden, but stainless really perform longer and better in my opinion. High quality utensils (just a few). Tongs, stainless large spoon, stainless large slotted spoon, whisk (Oxo makes a nice ergonomic one or opt for the Rosle that I have, mini whisk, basting brush. Unless otherwise specified, always choose stainless steel only options and preferably ones without silicone or plastic parts. In my experience, plastic discolors, cracks, and sometimes breaks off. Plus, I find that only stainless options to be more minimal, sharper looking utensil. If you don’t have stainless utensils or if you have any just-out-of-the-house young adults on your list, this set would be a great gift at under $12. 2 cup liquid measure. I like the linked plastic one by Oxo because it’s super easy to read and I also have this nesting set which I use a ton. 3 or 4 cup glass measure. Having 1 large glass measure is super helpful as you can microwave in it as well as make life easier when you’re cooking for a crowd. Good juicer. Definitely skip the electrics on this one unless you make your own juice in large quantities as they are more hastle and storage space than they are worth. Both I link to are dishwasher safe and the first highlighted link is my preference but my daughter loves the handled press style. Small masher. I use this way more than my big potato masher. Stainless scraper/chopper. I have only recently fallen in love with this tool but, man, I do love it! Want a beautifully smooth, frosted cake? This is the ticket. And cleaning up your sticky counter? Yep, this is the bomb. Also cuts things like scones perfectly because it has a ruler on the blade. Microplane. This is a great tool and use it instead of a hand held grater, zester and garlic press. Tomato knife. If you eat a lot of tomatoes and/or cut kids sandwiches, this little baby will get lots of use! Peeler. Lately, I’ve been loving the Y-style peeler but I’ve had this traditional style peeler for years and it’s awesome. Set of dry measure cups and spoons. Look for spoons with flat bottoms so you can pre-measure things a la mis en place—and yes, there is a difference between dry and liquid measure! If you use a lot of thick ingredients like mayonnaise and honey, check out this push-up style measuring cup and this small-capacity push-up measure. Small prep bowls – I love the featured bowls which have lids for advance prep work but also have a few glass ones. I’m a big fan of mis en place (which translates to putting everything in its place) and my older daughter and husband often help with prep work, so we use them often enough to have both in our drawer. These little guys make it so easy to pre-measure ingredients and have them lined up in the order that you’ll use them for any given recipe. This will really bump up your cooking efficiency! You best knife storage solution. Big blocks only work in the largest of kitchens; most kitchens are better with in-drawer or this walnut magnet strip versions instead. For you stainless steel lovers, this is a nice magnet wall mount and another option to consider is this $24 universal stainless space saving counter top block or this larger stainless style. 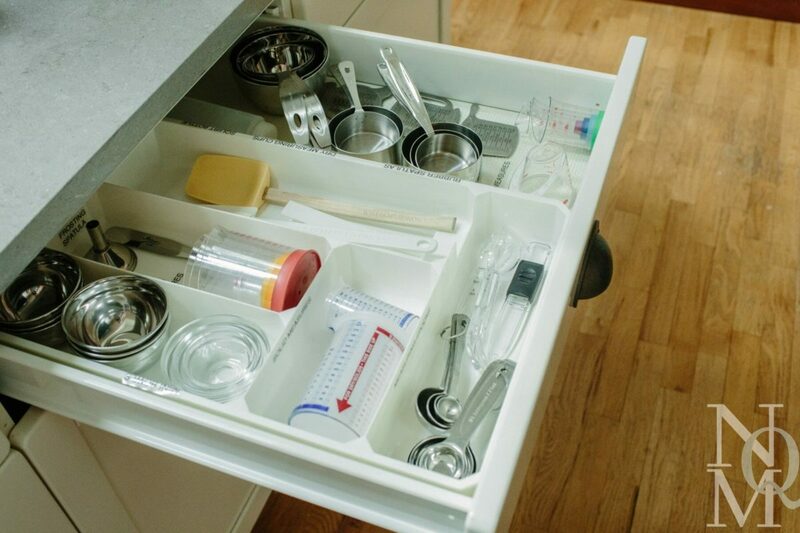 But no matter what, you really need proper storage as it’s a safety hazard reaching into a drawer full of knives and the blades will be dull almost immediately if they’re not stored well. Multi-purpose hand blender. Mine replaced my small food processor and hand mixer. If you didn’t catch the first installment, click here Kitchen Must Have Tools for Santa’s Wish List: Part 1.